If you’re looking for an easy dessert, look no further. This sorbet is just about the easiest thing you can make and it takes virtually no time. You can put a number of different spins on it as well. For example, next time, I think I’ll add some champagne or vodka to the mix to give it a little kick. Stir sugar and water together in a small saucepan over low heat until sugar has dissolved. Allow to cool in pan for a 1/2 hour (the syrup is extremely hot) before transferring to a 1 cup container and chilling it in the refrigerator. While the syrup is cooling, hull strawberries and place them in a food processor or blender. Blend strawberries to a puree, then pour through a sieve into a medium size bowl. Add lemon juice, and stir well. Refrigerate puree until syrup has chilled – about 1 hour. Combine chilled syrup and strawberry puree, then transfer to an 8-inch metal baking pan (stainless steel is best). Cover with plastic wrap and freeze for 3-4 hours. 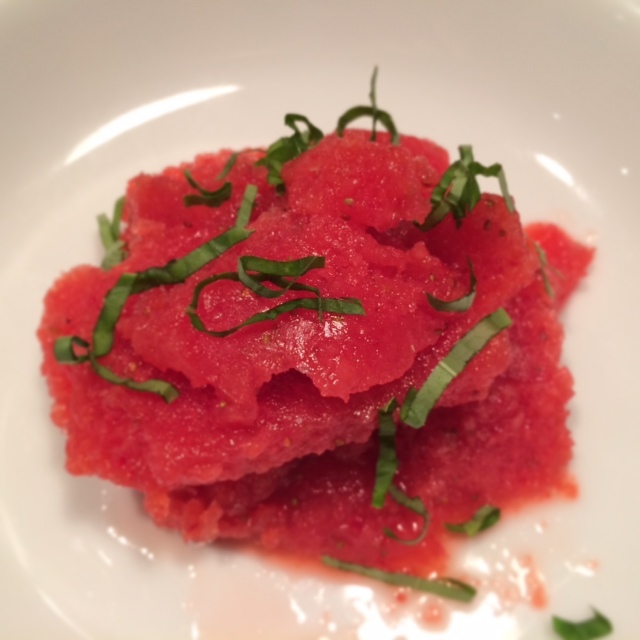 Remove sorbet from freezer and puree once more in a food processor or blender. Return strawberry puree mixture to metal pan, cover and freeze for a further 3-4 hours.